See more objects with the tag instruction, demonstration, inscriptions, girls, education, self-promotion, buttons, insertions, eyelets, hooks. This is a Placket Sampler. It is dated 1871 and we acquired it in 1981. Its medium is cotton and its technique is embroidered in cross, buttonhole, looping, and running stitches on plain weave foundation. It is a part of the Textiles department. Decorative embroidered samplers were made by daughters of the well-to-do for display in their homes, and were symbols of gentility as much as of skill. For daughters of the poor, instruction in needlework, while equally important, often had a more practical purpose: to prepare them for work as domestic servants. Going into service for a wealthy family would be a desirable opportunity compared to factory or mine work, and the creation of a neat sampler as a demonstration of skills to a potential employer was key. “Plain sewing” samplers demonstrated proficiency at hemming, seaming, patching, darning, buttonholes and plackets—all the skills necessary for making and caring for household clothing and textiles. 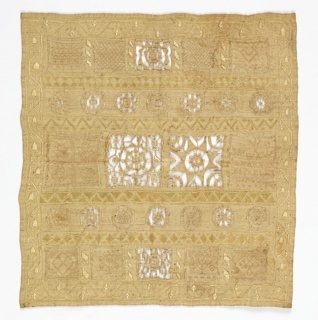 This sampler, made by a twelve-year-old girl, shows five plackets along with various types of eyelets, buttonholes and fasteners stitched neatly across the top. This object was featured in our Object of the Day series in a post titled Practical Sewing. This object was bequest of Gertrude M. Oppenheimer. It is credited Bequest of Gertrude M. Oppenheimer. silk and linen embroidery on linen foundation.